Chemicals used in flame retardants are frequently identified as suspected health hazards, and now researchers are eyeing them as potential factors in the rising number of thyroid cancer cases. A recent study published in JAMA noted that thyroid cancer cases have more than tripled over the past four decades. Survival rates remain high, but the mortality rate -- the percentage of patients who die -- has been rising over the past few decades. That's in contrast to mortality rates for most other cancers, which have been steadily declining. The cause of the increase isn't clear, but high on the list of suspects are the endocrine-disrupting flame-retardant chemicals commonly found in household objects like furniture and electronics. A Harvard study last year found that flame retardants may be implicated in thyroid diseases in women, with a significantly higher risk among post-menopausal women. A rising obesity rate is also a possible element, as is the reduction in smoking. Oddly, smoking protects against thyroid cancer, although physicians are quick to say they would never advocate taking up smoking for that reason since the other health risks far outweigh any thyroid-cancer benefit. 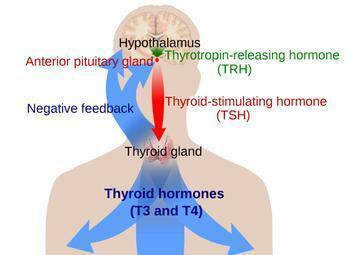 Thyroid cancer occurs more often in women than in men and is the fifth most common cancer in women. Symptoms are usually mild until the tumor advances to the point where patients have trouble breathing or swallowing or feel pressure in their neck. In a separate study that has not yet been published, researchers at Duke University found an association between three common types of flame retardants and one type of thyroid cancer, the Wall Street Journal reported. Dr. Julie Sosa of Duke's School of Environmental Health said researchers took dust samples from the homes of 70 patients with thyroid cancer and from the homes of 70 patients without cancer to find the association. Blood and urine samples were also studied. Sosa noted that one flame retardant, DecaBDE, is chemically similar to the thyroid hormone. That could confuse the body and disrupt the thyroid's functioning, she said. DecaBDE is no longer produced in the U.S., but it may be used in products manufactured overseas.